Nancy found these faux fish in a floral supply store. With the help of a neighbor, she added rods that secure them into the ground. When she started her succulent mermaid’s garden several years ago, Nancy chose “plants that had strange shapes or textures, and that looked like underwater plants or sea creatures.” She uses them to “shift you out of the normal” into “an intriguing, freeing change of perspective.” Accessories include weatherproof faux fish, mermaid statuary, ceramic sea stars and chunks of turquoise slag glass. Below are captioned photos of the main plants shown in the 4-min. video I made when I visited Nancy: Explore a Succulent Mermaid’s Garden. Learn more about any or all of them in my books, in particular Designing with Succulents (2nd ed.). Btw, cordyline, dichondra, tradescantia and bromeliads aren’t succulents, but they make great companion plants because of similar cultivation requirements. Succulents that resemble coral-reef flora lend themselves to containers that immerse the viewer in an undersea experience. This succulent clamshell planter sits atop lava rocks near my home’s entry. It’s semi-shaded by Texas privet, the trunks of which frame the arrangement and repeat the upright lines of Senecio anteuphorbium. Certain succulents (the senecio, the aloe at left and the Medusa euphorbia) came from the original arrangement, which I made several years ago, but most are new. Those that had outgrown the planter—notably Crassula ‘Gollum’ and other jades—found homes in the garden. Here’s my list of plants and materials, along with my method and how to care for the arrangement once completed. This goes with my YouTube video, DIY Undersea Succulent Clamshell. Have fun! Plants: Below are what I used, but there are so many succulents that suggest tidepool flora. Feel free to make substitutions. See “Marine Life Look-Alikes” on page 101 of Designing with Succulents (2nd ed). Aloes that look like starfish (4 or 5, various sizes). I used Aloe maculata and in 3-inch pots, the dwarf species A. ‘Christmas Sleigh’, A. ‘Pink Blush’ and A. ‘Snow Storm’. A Medusa euphorbia. I used E. flanaganii. Euphorbia anoplia (Tanzanian zipper plant). Mine was in an 8-inch pot. — Keep in mind it should look as though the succulents were undersea flora and fauna inhabiting a coral reef. — Rotate plants outward so they’re facing the viewer. — Place tall plants in the back. Put small ones in front and use as filler. — Use plants and their root balls, shells, chunks of coral and/or rocks to retain soil in the clamshell’s U-shaped dips. To make it last and look good for years, place it in bright shade where it’ll get only a few hours of sun daily, ideally early morning or late afternoon. Water the plants lightly once a week in summer and once a month (or not at all) in winter. Err on the dry side. This is a nondraining container, so don’t let it sit out in the rain or get watered by automatic irrigation. Although the pumice in the bottom will absorb moisture, it’s not a substitute for drainage. If the arrangement gets flooded, tip it slightly so water drains out. Keep it tidy: Deadhead spent flowers, peel or snip off dry lower leaves, and remove debris that may fall onto or into the plants. *How much will it cost? This succulent-planted clamshell at Roger’s Gardens is priced at $300. If you DIY, expect to pay about half that—less if you use cuttings. 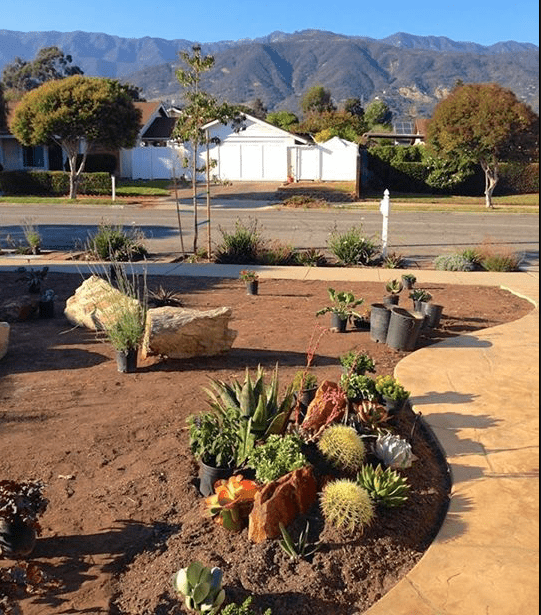 See how succulents combine with bromeliads and outdoor art in this undersea-themed “mermaid’s garden.” The owner/designer is Nancy Englund, president of the Laguna Beach Garden Club. Supermarket kalanchoes (Kalanchoe blossfeldiana) are succulents you grow mainly for their flowers. They have been hybridized and sold as flowering plants long before succulents in general became popular. Succulents are plants that look like flowers, and although all succulents produce them, they’re generally not the reason people buy them. Yet this one succulent has been commercially grown—and sold—for its bright, cheery blooms for decades. Kalanchoe blossfeldiana has dark green, scalloped leaves, forms a 12-inch-diameter shrub, and produces bouquet-like flower clusters off and on (mainly fall-winter). Hybrids come in every warm hue as well as shades of cream, white and multicolored blends. Because Kalanchoe blossfeldiana tolerates conditions that would kill most nonsucculent plants, it has great commercial value. A variety known as calandiva has ruffled petals. Each dime-sized calandiva floret resembles a tiny chrysanthemum. For an eye-catching floral display, tuck several supermarket kalanchoes into a window box or flower bed. Kalanchoe blossfeldiana plays well with other succulents, adding bright pops of color for weeks at a time. And when you combine several of the same kind in one pot, you’ll get what looks like one big, lush plant massed with vivid blooms. — As with most succulents, supermarket kalanchoes want good air circulation, three or four hours of bright but not hot sun daily (morning sun is best), protection from frost and extreme heat, and soil that’s moist but not soggy. — Deadhead spent blooms and let the plants rest until the next round. If these succulents have a downside, it’s that they’ll bloom themselves to the point of exhaustion. With TLC they’ll recover. — Deadhead spent flowers. This seems obvious, but the plants are repeat bloomers. They’ll perform better and look best with old flowers out of the way. –Use with rosette succulents to create floral-style compositions. Supermarket kalanchoes with cream or pastel blooms look especially good with rose, pink and/or teal echeverias. – If, after successive bloom cycles, the plants go downhill, take cuttings if you want the same color again, or simply discard the plants. Replacements are easy to come by. Sources: If you’re in the San Diego area, Weidner’s Gardens nursery in Encinitas is one of the top growers of Kalanchoe blossfeldiana hybrids, and their plants are perfection. Otherwise, you can usually find Kalanchoe blossfeldiana in the garden section of big box stores…and of course, in supermarkets. How to grow, care for, and create more succulents. Fifty years ago, each hefty, half-inch-thick issue of Sunset magazine cost 20 cents and brought days of useful, entertaining reading about gardening, food and travel. My parents subscribed, so they no doubt read the June, 1954 cover story about succulents. I’ve always assumed they surrounded their Southern CA ranch home with succulents because cuttings were free for the asking, and my father didn’t want to water the garden more than absolutely necessary. But was it possible that my parents were onto…a trend? Well, no. The six-page cover story is mostly about container gardens for “the outdoor living areas of the Western house: its patios, lanais, decks, and paved areas…And if ever a plant was made for a pot, it’s the succulent.” Containers didn’t appear on my folks’ patio until the ’70s. With geraniums. The succulent article’s 25 photos are B&W except for those shown on the cover. 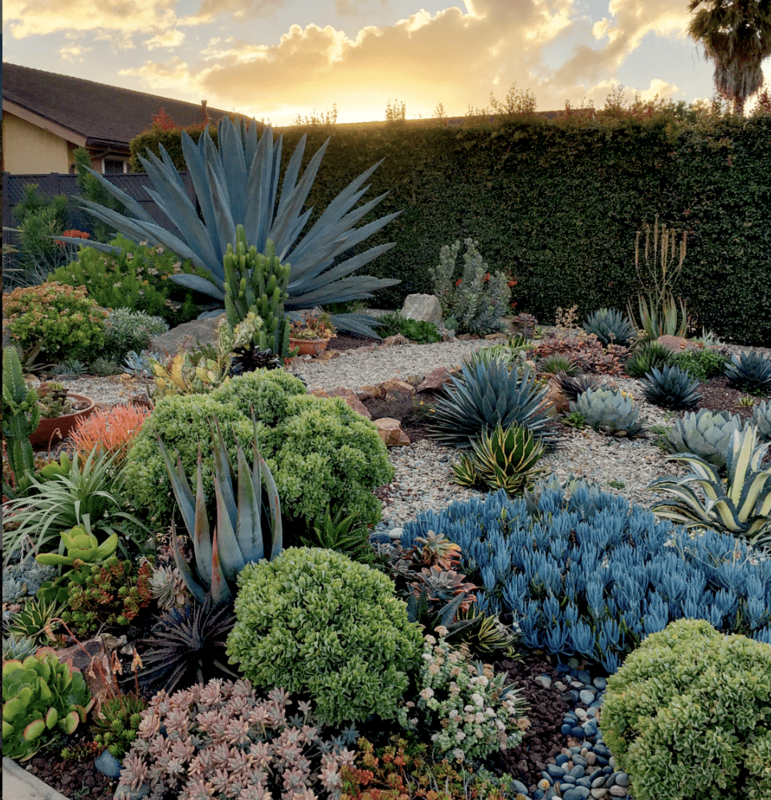 In 4,000 words, Sunset editors give an overview of succulents and their care, design ideas, and a “beginner’s collection” of about 50 varieties. Most are still fairly common, but Euphorbia valida is now E. meloformis; Gasteria maculata is now G. bicolor; and Cotyledon hemisphaerica is Adromischus hemisphaericus. Mentioned but nearly unknown today are Echeveria rosea grandis and Sedum amecamecanum. “Do you mean Sedum americanum?” asked Google. Uh, not unless Sunset made one whopping typo. I found out that this stutter-named sedum has “fragile leaves”—doubtless why it’s not much in demand. “Kalanchoe flammea” in the illustrations sure looks like Kalanchoe blossfeldiana, shown here. Don’t you wish it had kept its earlier, more descriptive name? Although it’s shown in the article, perhaps Sunset shouldn’t have bothered. The defining characteristic of Drosanthemum floribundum is lost in black and white. As a little girl, I was proud to pronounce the name of this searing pink ice plant: “mesembryanthemum.” And I would be still, except it’s since become drosanthemum. *Special thanks to friend, colleague, and retired Sunset Senior Garden Editor Kathy Brenzel for presenting me with the 54-year-old issue. In case you’re wondering, all its content is copyrighted, so apart from short excerpts, I’d need permission to share it. There’s no link to it because it’s not online. Of the dozen or so types of cacti in my garden, I have more opuntias than any other. Also known as paddle cactus or prickly pear, Opuntia species have stems shaped like ping-pong paddles. New pads grow from older ones after rains drench the roots and help fuel new growth. Typically these new pads, and flowers that turn into fruit, form along the edge of the pads and orient themselves for maximum sun exposure. For garden plants, I prefer spineless or near-spineless varieties, like Opuntia cacanapa ‘Ellisiana’, O. ‘Burbank’s Spineless’ and O. ficus-indica. These grow from 3 to 7 feet tall. I also have dwarf varieties in my miniature landscape, which I designed to suggest a Latin American mountain town. Photos of it and the specimen below are in my book, Designing with Succulents, 2nd ed. Flowers of opuntias are spectacular, and open in succession. So although the blooms last only a day or so, the show lasts a week or more. As with all cactus, opuntia spines are modified leaves. There’s a good reason to grow prickly varieties—whether Opuntia species or others, they’re breathtakingly beautiful when late afternoon or early morning sun backlights translucent spines. Certain varieties, such as O. Santa-rita, have purple pads. It’s been my observation that these tend to attain their best color in desert gardens; here in Southern CA, the pads stay green with a purple tinge. I grow an intriguing variety that has beard-like white filaments, but I recently had to trash much of the plant because scale insects snuck under the threads and colonized the pads unnoticed. I did manage to keep a few unblemished ones, which I treated with Safer soap and replanted. Opuntias are easy to start from pads; simply slice or break one off and stick it in the ground. Knock one off, and where it falls it’ll form roots. The egg-shaped fruit of opuntias is edible and a colorful garden enhancement. Opuntias are unique among cacti in that they have two types of spines—needles and glochids. The latter often is nearly invisible, barbed, and will go home with you if you touch it. Glochids create fuzzy polka-dots on the paddles of Opuntia microdaysis. Beautiful…but beware. Because cactus pads are moisture-storage organs filled with a mucilaginous gel and protected by a tough, waxy skin, they’re slow to catch fire. Opuntias not only make great firebreak plants in wildfire-prone areas, they’re efficient at conserving water and need no irrigation other than rainfall. Tender new opuntia pads (nopalitos) are sold in Mexican markets. They’re good in salads and can be cooked as a vegetable dish that tastes like green beans.